I tried to think about why I wanted an Eclectus parrot out of all the parrots I could choose from. I did a lot of research before actually settling on an Eclectus. I had a few ideas about what I wanted in my new family member. I wanted a quiet bird that is not known to be one person bird. Because my husband really did not want a bird in our house. I wanted one with the least amount of dander, to decrease the possibilities of allergies that may appear in the future. So I had planned on buying a baby male, After waiting several years for my home to be completed, I contacted a breeder in Louisiana and he had one Red Sided baby just hatched. He asked me if I wanted it, of course I said yes. He said we would not know if it was a male for quite a few weeks. I waited patiently and then at about 3 weeks he asked me if I would keep it if it was in fact a female. I said yes because I think it was probably meant to be. About another week went by before he started to see a little bit of red in her feathers, it was a female! I was so excited. So I started doing more research on females. I named her Pepper you know Louisiana, cayenne pepper, red bird. Pepper was hatched on Februrary 1st and I picked her up on May 16 after visiting her every day for two weeks. Usually Eclectus parrots are hard to hand feed but her breeder said she was the easiest to feed of all the Ekkies he's ever fed. I was even able to feed her once a day while she weaned. He also said she was the noisiest. She started the baby bird squawk every time she saw me and also kept that squawk for quite a while when she arrived home. She is a very happy bird and is really quite when anyone is in the bird room but talks quite a lot when we are not. She only says a few words , Hi, hello, I Baby. But she says quite a few that I don't understand yet. she also makes lots of cute sounds . She hardly screams at all, in fact I've only heard her scream twice and that is when I was putting on her flight suit. She has never bitten me but she is very cage territorial to anyone except me. She is a joy to be around and will happily sit on my shoulder quietly looking at me most of the time. She really likes kisses and loves being held. She does not like to be cuddled or having her head scratched. She does share her room with a cockatoo and 3 cockatiels with no problems. She has a voracious appetite. She will go into the cockatoo's cage when he's not around and eat any food in his cage. She likes to play with balls and will roll them back to you sometimes. She will throw them off her cage every time though. She likes swinging and climbing on things. she will forage daily for as much food as I will hide. She does not like to shower yet, she kind of just tolerates it. She plays very well alone but really likes to be held. 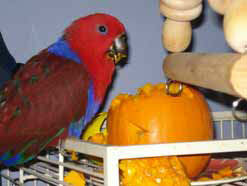 I am very glad that I chose an Eclectus and I�m glad I have a female, even if they get hormonal. 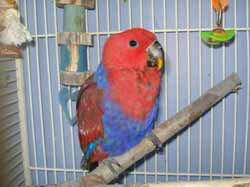 Eclectus Parrots originate from Australia, Indonesia, the Solomon Islands, and New Guinea. Only a few of these subspecies are common, They are the Grand, Red Sided, Vosmaeri , and Solomon Island subspecies, the Solomon Island eclectus being the smallest in size.The Eclectus is con-sidered a medium size parrot. The length of the commonly available Eclectus subspecies ranges 12 to14-1/2 inches and the wingspan is from 2 to 2-1/2 feet.